Andersen Mfg 3230 Ultimate Connection Safety Chains - Includes Bracket Hardware. Andersen Hitches Ultimate Connection Safety Chains are built tough! Safety chains act as a safety system to connect the 5th wheel to the towing vehicle. They come into play in the event of a disconnection. They have been road-tested and meet all current requirements for safety chains. 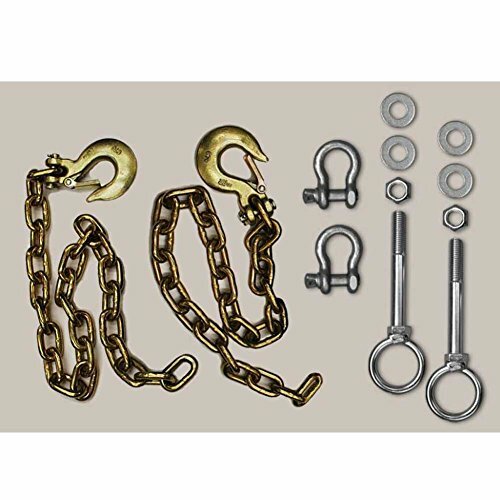 The overall length of the chain with the attached clevis hook is going to measure 38-1/2 inches, just the chain itself is going to measure 35 inches long. They offer a weight capacity of 24,000 pounds. For Andersen Ultimate Fifth Wheel Connection Only. Ultimate Connection Safety Chains are built tough. Product comes with everything you'll need to install the chains with your Ultimate 5th Wheel Connection (Rail or Gooseneck version). If you have any questions about this product by Andersen Hitches, contact us by completing and submitting the form below. If you are looking for a specif part number, please include it with your message.